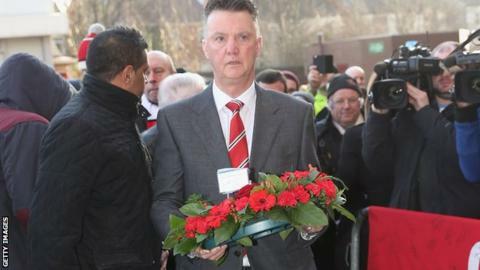 Manchester United boss Louis van Gaal laid flowers at Old Trafford to mark the 57th anniversary of the Munich air crash. Van Gaal also accompanied fans as they sang the 'Flowers of Manchester' tribute song and listened to speeches. Flying back from a European Cup tie in Belgrade on 6 February, 1958, the team plane refuelled in Germany and crashed at the third take-off attempt. Eight United players were among 23 passengers who died. United had just reached the European Cup semi-final after overcoming Red Star Belgrade in the quarter-final. Van Gaal subsequently spoke about the service in his media briefing on Friday before the Premier League visit to West Ham. "It was a group of players who gave a lot of joy to the people at that time," he said. "They played a big part in the history of this club. We have to remember that always." Twenty-one people lost their lives at the scene on that day in 1958. Tommy Taylor and Roger Byrne, all senior England internationals and expected to be part of the 1958 World Cup squad, were among those killed after the plane crashed in snowy conditions after two take-off attempts had previously been aborted. Another senior England international, Duncan Edwards, and the pilot, Captain Kenneth Rayment, died in the days afterwards because of the injuries they sustained. In addition to the players, three members of United's backroom staff, eight journalists, two crew and two other passengers were killed. Sir Bobby Charlton was among those who survived. It was the first Munich anniversary since Van Gaal was appointed as David Moyes' successor in the summer.